Aravaipa Running's Jubilee Paige, report author Laurie Staton and ultra veteran Bill Schultz. Photo courtesy Laurie Staton. Whether it’s for the fastest times or longest distances, Courtney Dauwalter’s dominance at Tahoe Rim Trail, Camille Herron’s 24-hour record at Desert Solstice, and Amy Mower’s and Don Winkley’s 6-day records (among several others) at Across the Years (ATY) are all examples of athletes in a sport with depth and complexity. But step away from the speed of a passing freight train of numbers that boggle the mind, and ultrarunners are quietly taking joy in their longevity in ultrarunning that’s lasted for decades. It’s not about the number of races you’ve run throughout your career, but a measure of how durable your commitment to the sport is over time. Across The Years offered yet another enticing combination of familiarity and the unknown. 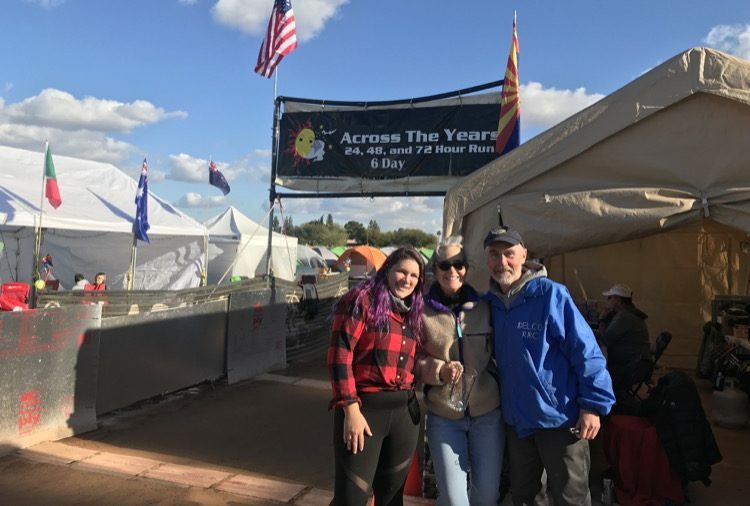 The Aravaipa Running folks have it completely dialed, welcoming record-chasers as well as first-timers with professional medical people, great food, space to camp out, a USATF-certified course and Mike Melton’s impeccable timing. With a solid sound system and a killer playlist, it was like an all-comers track meet at its best. All this, without the torment of missing a cut-off. But the weather insisted on testing us this year with cool temperatures, wind and driving rain by the fourth of six days. I was curious to see if I could make a go of a nice, round 200k after cruising through 100 miles, but I was swearing like a sailor and nearly broken by the cold after only 33 hours and 101 miles. There’s been a wave of participation in our sport in the last 10-15 years, even in the 60, 70 and 80+ age groups. These folks started in the sport later – perhaps after another rodeo – and have been wildly successful. How long they stay in the sport is yet to be seen. Yet there are stalwarts who make an indelible mark on the sport and choose to stay for other reasons. Ann Trason, arguably the greatest ultrarunner ever, continues to toe the line with the rest of us. Even before ATY, Ed Dodd had been running 100-milers for nearly 40 years. As have Ray Krolewicz, Nick Marshall, Lion Caldwell and Doyle Carpenter. It’s revealing of both the sport and its participants that it’s possible to stay in the sport and run a 100-miler every year. For decades. I don’t think it’s arguable. The March issue would be your first issue. We are working on that now.